Ever heard of Susan Rahm? 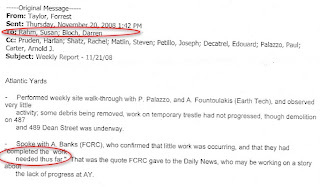 One key contributor to the Empire State Development Corporation's (ESDC) oversight of Atlantic Yards is an unpaid consultant--a retired partner at a major law firm, with a background in city planning and urban redevelopment--who has volunteered several days a week since the summer of 2007, well after the project was approved. While it's not unheard of to have unpaid (or barely paid) workers serve in public capacities--Mayor Mike Bloomberg takes only a buck, and Caroline Kennedy famously raised funds for the school system--Rahm is the only person now at the ESDC functioning in such a role. "Empire State Development is incredibly fortunate to draw on the years of experience that Ms. Rahm provides to us in her voluntary role as an advisor on the important Atlantic Yards project," ESDC spokesman Warner Johnston told me in response to my queries. "Public service is at the heart of good government and citizens of Brooklyn benefit from Ms. Rahm's time, expertise and commitment to assisting Empire State Development bring this critical project to fruition." That may be. However, the reliance on a volunteer--less accountable than a staffer employed through normal channels--raises additional questions, in my mind at least, about the ESDC, especially given the controversy surrounding the project and the unease about the ESDC's "truly amazing powers" to pursue eminent domain. After all, the ESDC's willingness to defer to Forest City Ratner regarding such basic questions as utility work does not bolster the authority's reputation for accountability. Also, as I describe below, there are contradictory accounts about what role Rahm plays. Also, Rahm, who in 1999 was honored by New York Commercial Real Estate Women (NYCREW) as "Woman of the Year," may have a professional acquaintanceship, at least, with Forest City Ratner executives like Joanne Minieri and Maryanne Gilmartin, both of whom, for example, spoke at a 2002 NYCREW event. There's nothing wrong with that--commercial real estate is not a large world, especially among women. Still, it's less likely that Rahm has professional acquaintanceships with community members concerned about Atlantic Yards. Rahm was brought in by the administration of then-Governor Eliot Spitzer to work on the project. How typical is such a role? "We have no other in-house volunteers at this moment," Johnston said, adding, "State government has used pro bono volunteers in many different capacities over the years." I couldn't find any state guidelines about the role of volunteers. Nor could I get formal comment from any government watchdog groups about such a situation, though one representative, commenting generally, suggested that any level of concern would depend on the significance of the person's policy-making role. And Rahm, according to Johnston, has no policy-making position, thus not triggering a requirement to file a financial disclosure form under the Public Officers Law. Except maybe she does help make policy. Speaking in February at a meeting called by the Council of Brooklyn Neighborhoods, ESDC Ombudsman Forrest Taylor said, "As an employee of the state, I attend all the meetings I’m invited to, and I take those issues and problems and concerns back to my boss, Susan Rahm, at ESDC." Presumably that meant that Rahm has a policy-making role. However, Johnston told me shortly afterward that Rahm was not, in fact Taylor's boss. An email I referenced in February, and reproduced at right, was ambiguous; it shows Taylor writing to Rahm and Darren Bloch, as if they were both on a level above him. Johnston explained that Rahm "is a unpaid consultant to the AY project and as such has no direct reports. Mr. Taylor reports to Darren Bloch, EVP." Well, either Taylor has trouble remembering his boss or the ESDC operates in a somewhat loosey-goosey manner. I filed a Freedom of Information Law (FOIL) request asking how Rahm's role and responsibility was introduced to ESDC colleagues when she joined ESDC as a volunteer in 2007. I was told there were no responsive documents to disclose. I have another FOIL request pending. On the web site of the law firm Kaye Scholer, Rahm is listed as a retired partner; her resume lists a history of working for the D.C. Redevelopment Land Agency and the New York State Urban Development Corporation (both the formal name of the ESDC as well as its precursor). 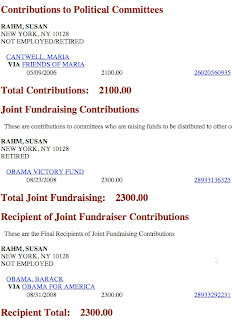 In 2008 documents (right) filed with the Federal Election Commission (FEC), while Rahm was working on Atlantic Yards, she listed her occupation as retired or "not employed." Technically, that seems accurate. But working on Atlantic Yards for the ESDC is not the same as volunteering at the local soup kitchen. Enormous policy questions regarding AY, including the level of indirect subsidies, remain unresolved. So, while Rahm likely was not required to tell the FEC she was volunteering on Atlantic Yards, shouldn't the ESDC have been more forthcoming with the public? Perhaps ESDC CEO Marisa Lago could be asked at the hearing tomorrow how exactly Rahm contributes, what kind of interaction she has with Forest City Ratner, and why the agency was so ill-equipped it needed a volunteer to help out on this project. Good job! Yet its amazing that this has gone unnoticed for so long. She has been functioning as a Boss for years and was under the wing of Ari (check THAT connection). But it gets worse. Has anybody ever seen a org chart for ESDC? Good luck finding one, in or outside the structure. People come, go and responsibilities are reassigned on the whim of the exec office with out rhyme, reason or justification. And the place is a political and nepotism dumping ground, full of staff who have NO IDEA what other people actually do and, in many cases, no idea of what THEY are supposed to be doing themselves. ESDC continues to be one of the worse development organizations in the country, a deep embarrassment to NY which should have one of the STRONGEST one give the state's size and wealth.